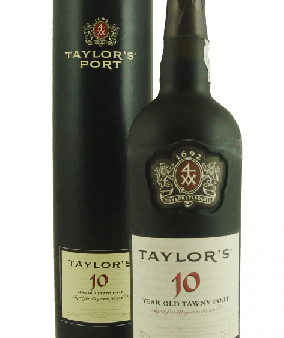 Taylors 10 year old tawny Port. Elegant and smooth. Lovely garnet/tawny colour. Spicy, red fruit nose. Nutty element too, with nuances of caramel and clove with aromatic hints of exotic Fruit to the fore on palate, with sweet, rich, chocolate-coated plum and cherry notes, a nice background of acids and tannin, and emerging nut and spice warmth into the long finish. Excellent. You can pick a free cards Birthday or thank you card. This style of Port is fully matured in seasoned oak casks each holding about 630 litres of wine. Here, over many years of ageing, the wine gradually takes on its characteristic amber ‘tawny’ colour, slowly developing the complex mellow flavours and the smooth luscious palate which are the hallmarks of Tawny Port. Taylor’s blends its magnificent 10 year old tawny from its extensive reserves of old cask aged Ports matured in the firm’s cool and tranquil cellars (known as ‘lodges’) in Oporto on Portugal’s Atlantic coast. Taylor’s 10 Year Old Tawny is a superb example of the aged tawny style. Mellow and elegant, combining delicate wood notes with rich aromas of mature fruit, it is bottled for immediate drinking. It is the best selling 10 Year Old Aged Tawny Port in the UK. Taylor’s 10 Year Old makes a delicious dessert wine, and combines particularly well with flavours of almonds, berry fruit or dark chocolate. It can also be enjoyed as an accompaniment for rich, blue veined cheeses. It is excellent at the end of the meal, as a crowning moment of an enjoyable evening, served on its own or with a plate of walnuts or roasted almonds. They benefit from being served slightly chilled, particularly in warm weather.